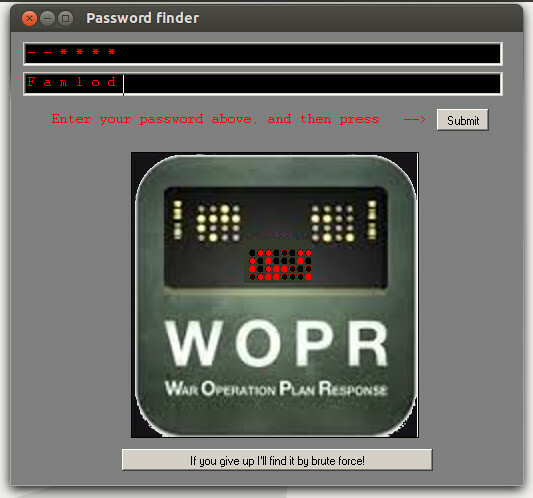 Password entry as shown in the 'movies'. I've enjoyed umpteen movies and DVDs in which someone is shown 'hacking a password'. For reasons of heightening dramatic tension, the electronic display nearly always shows the hacker getting feedback whenever he/she hits any single correct digit of the required password. Surely no-one would write such code! The following program is my homage to them! Type your guesses into the lower textbox and press [Submit]. Any correct letters are shown. Don't cheat ( at least not right away). Download from the link and unzip. Gauss said he achieved his results 'durch planmassiges Tattonieren'. ( - sometimes attributed to Einstein) My results come more from inspired guesswork and serendipity.